A delegation of government officials from Vietnam, now experiencing its worst drought in nearly 100 years, visited UC Davis and the Sacramento-San Joaquin River Delta this week to hear about the lessons learned during California’s multiyear drought. The meeting was an outcome of visits to Vietnam earlier this year by President Obama, U.S. Secretary of Agriculture Tom Vilsack, and California Department of Food and Agriculture Secretary Karen Ross. During Monday’s symposium, speakers from the university and government agencies discussed the complexity and coordination of California’s water system; strategies for forecasting, monitoring and responding to drought; and how California’s agricultural sector has dealt with the drought. During the Tuesday delta tour, the delegation visited the C.W. “Bill” Jones Pumping Plant near Tracy, where water from the delta is pumped into the Delta-Mendota Canal for transport south, and the Tracy Fish Collection Facility, where fish are gathered before they reach the pumping plant and and later released into the Sacramento River. The group also participated in a boat tour of the delta, departing from Brannan Island State Recreational Area. A video of the delegation’s delta tour is available on YouTube. 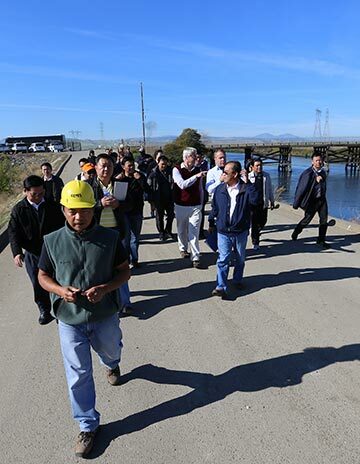 Hosting the delegation along with UC Davis were the California Department of Food and Agriculture, the U.S. Bureau of Reclamation, the San Luis Delta-Mendota Water Authority, the U.S. Geological Survey and UC Agriculture and Natural Resources.